Having a guest sign a photo is the perfect way to remember the day you met your hero! All guests at EM-Con will be seated in the signing area, ready to meet fans and sign autographs.. When purchasing an autograph you will be able to choose from a selection of photographs at each desk wit the cost of photographs included in the autograph fee. If you prefer, you can bring your own item of memorabilia to be signed for the same price. Is there a charge for autographs? Yes – autographs usually start at £10 though prices will vary according to the guest. You can check the price using the list on this page and and at their table on the day of the convention. If you take advantage of having a Photoshoot with one of the guests, they will sign it at their table for the same price as a regular autograph – they won’t sign it for free. Will the guests sign my memorabilia? Yes – in most cases, guests will sign relevant memorabilia within reason. This will cost the same as the listed autograph price. What time of the day can I get an autograph? 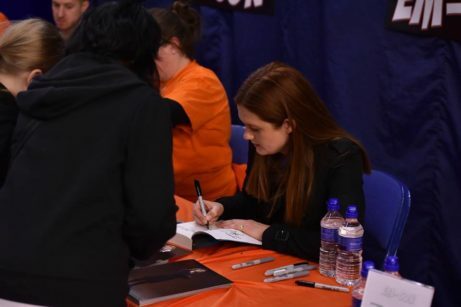 The majority of guests will be at their signing tables throughout the day from open to close, unless they are scheduled for a Q&A panel or a photoshoot. If you want to avoid queues we suggest waiting until later in the day or getting a VIP pass which allows you to go to the front of a queue. *All prices are subject to change and should be seen only as a guide.